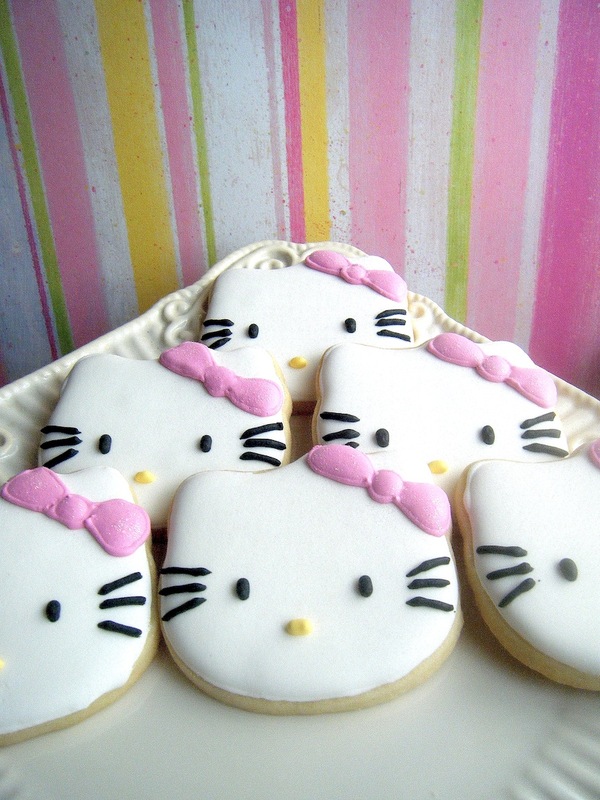 Baking in Heels: Hellooooo Kitty . . . . .
Hellooooo Kitty . . . . .
What girl doesn't like Hello Kitty? I mean what's not to like? One of my oldest friends adores Hello Kitty....and when I say adore, I mean she has EVERYTHING Hello Kitty....down to a Hello Kitty tattoo. So when I saw this Hello Kitty cookie cutter I just had to get it. Her 30th birthday is coming up and these cookies were sure to make her day. I remember when I turned 30.....wow what a crazy night...and she was right by my side. I had to do something special for her birthday. So the cookie cutter arrived about a week ago....I know, its been a while....but I was very busy. Come on you get busy too. Things just get away from a girl sometimes. I mean you wake up and check your email....then that facebook page. Then you look at some cookies cutters, because well, you just don't have enough....and before you know it the entire day has been wasted and you didn't bake a thing. Yes, that is usually how my day goes. So I woke up and was determined to get these cookies baked. After all nothing screams friend of the year like baking cookies for your friend......right? Well here's to you Starr.....Happy 30th Birthday...wish I was there to celebrate with you. Muah! Awwwwwwww Gisselle! Im in tears! They are soooo cute!!!!! Thank you so much!!! Love you!